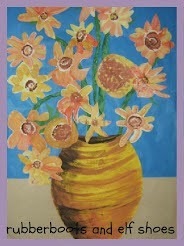 I finally found a way to do show and tell that I not only could live with, but actually like and enjoyed. I had banned show and tell from my classroom for a number of years. I could not stand the "bring and brag" that it often turned into. And I could not keep my eyes from glazing over and the kids sitting attentively for another "this is a rock that I found on my driveway this morning" or "this is the toy that I got from McDonalds when I went with Grandma - it is very special to me". 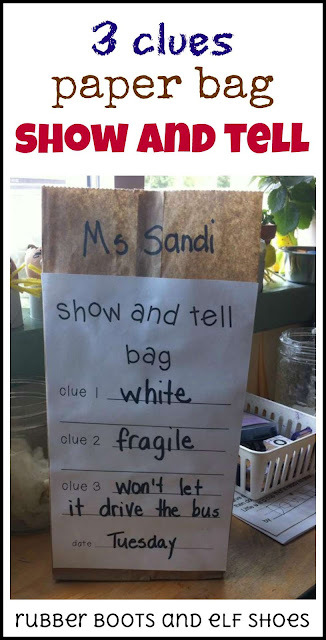 I found other ways for the children to use their oral language skills and practice speaking in front of others. This year, one winning smile accompanied by some gentle cajoling, and a bit of serendipity, resulted in show and tell that the shower-and-teller, the rest of the kids, and the teacher enjoyed. We had one show and tell a day. We had show and tell from Spring Break until the end of the school year. 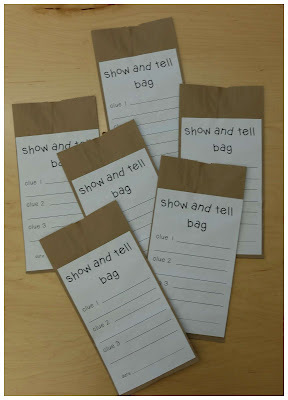 Show and tell bags went home on Friday for the 5 kids the following week. Name on the top of the bag. Their day on the bottom. 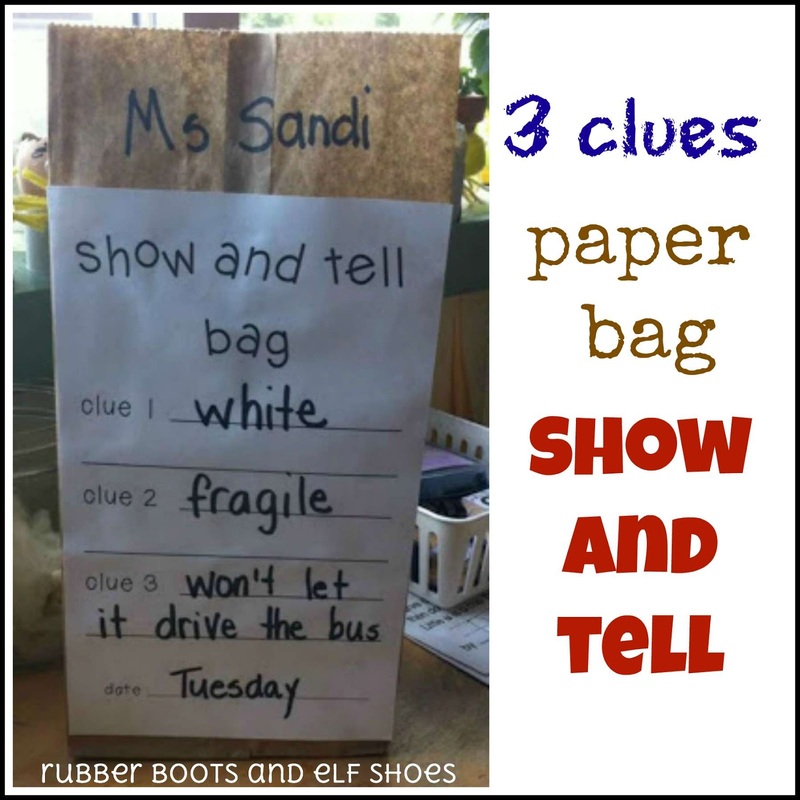 Click the photo to download your show and tell bag printable. Bring something that interests you. Make sure that it is not a toy. Make sure that it is not so very, very very special so that someone would be very upset or cry if the item were lost or broken. 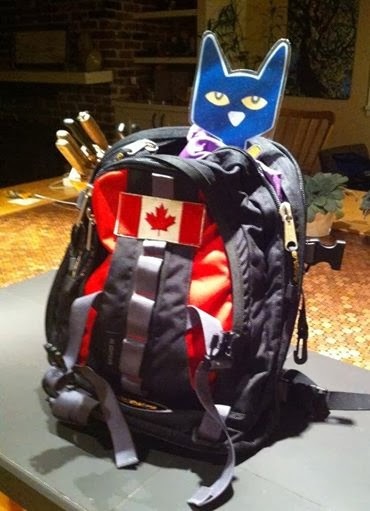 The item should be able to fit in the bag (but we were flexible on that requirement). This is where the family involvement came in. And a whole bunch of learning. 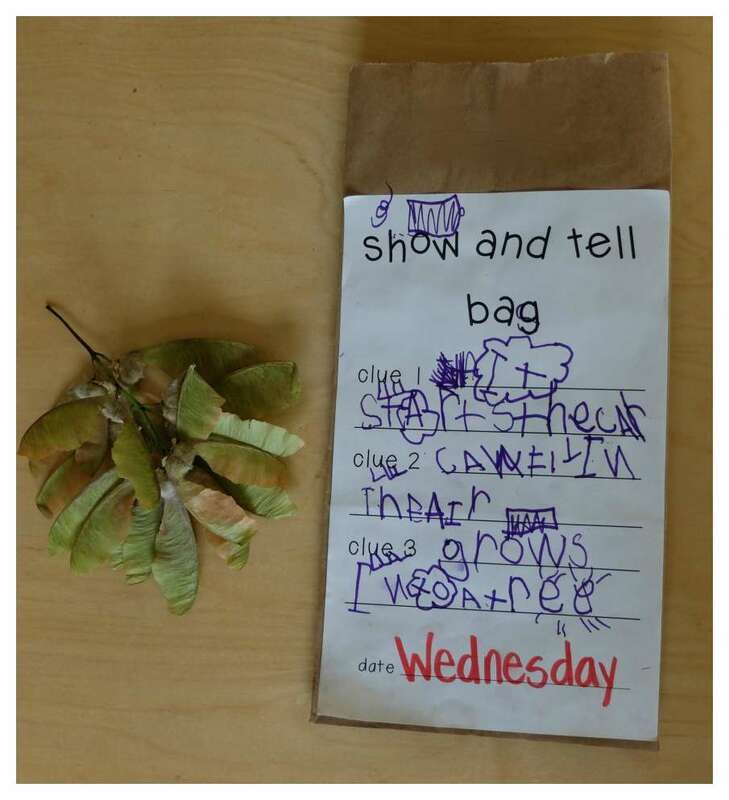 Many k-kids have a hard time telling the difference between a clue and telling someone what something is. A clue is telling a little bit about something. Not everything. The kids worked with their families to create and print the clues. I loved how some of the kids used our reading strategy graphics on their own writing :). 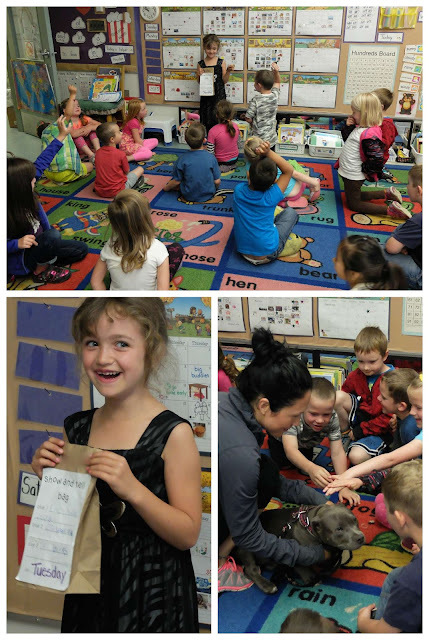 Each child was in charge of telling the class their clues, and accepting 3 guesses per clue. Engaging for the speaker, engaging for the listeners. 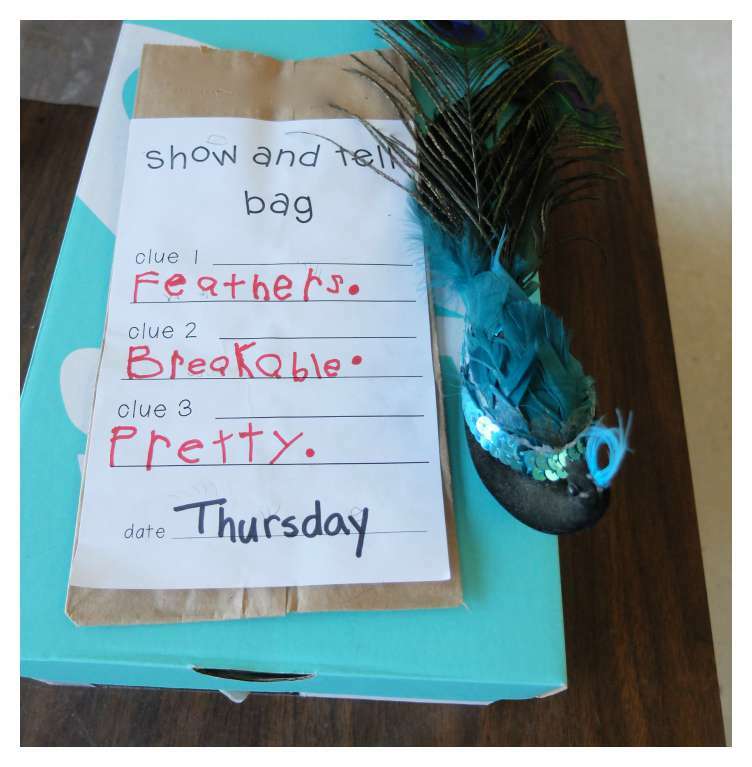 This friend's clues were all about her puppy (pre-arranged with mom who was waiting just out of sight). We also had a baby brother for show and tell!! We practiced speaking clearly so that whoever was sitting at the back of the carpet could hear. We practiced waiting our turn to guess what the object in the bag was. And we practiced being okay with it if we did not get a turn to guess. 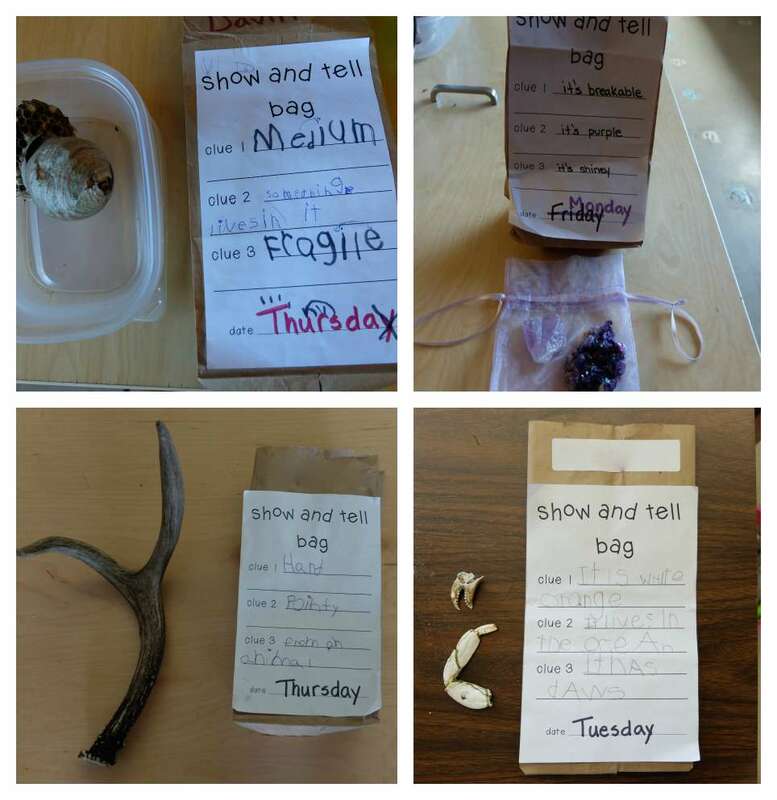 We got to see and learn about a number of things from nature. We learned to be respectful of and take care of fragile treasures. We learned to ask more questions about things that intrigued us. 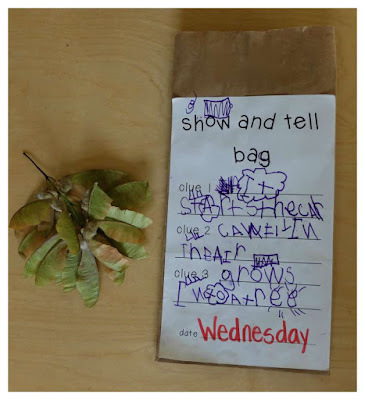 And I learned that show and tell can actually be fun and full of lots of learning. Any guesses what my show and tell was? Thank you so much for sharing. This is a fabulous way to practice speaking and listening skills. I too had banned show and tell, but maybe I'll give it another go. Lots of good speaking and listening practice. Let me know if you try it and how it works. 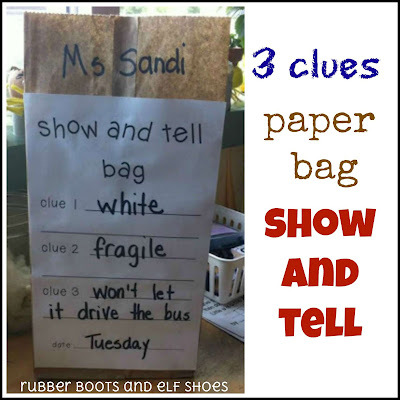 Yep, you guessed it: Sandi's new take on Show and Tell. Thank you for stopping by. I haven't thought about using 3 clues for showing our 100 Day projects - thanks for the idea. 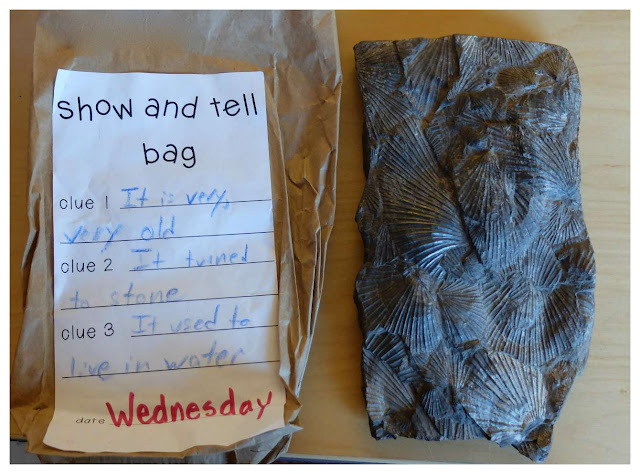 Love this way to do Show and Tell! I was surprised how much the kids and I enjoyed it. 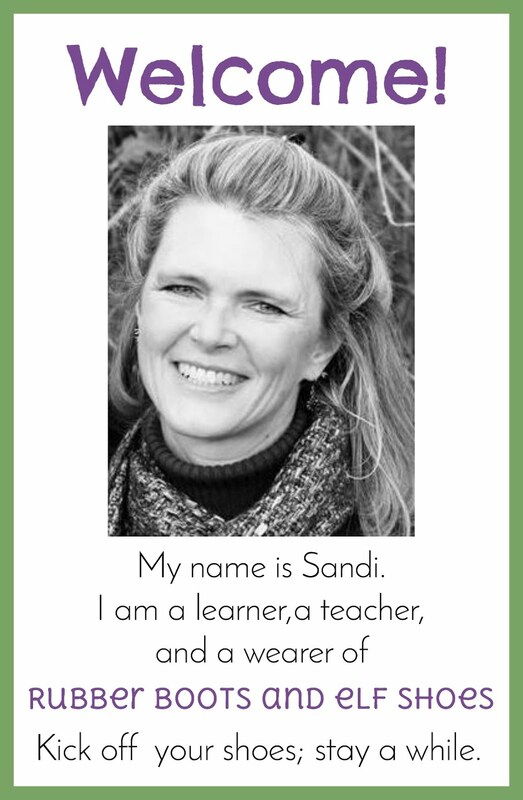 Okay, I totally LOVE this, Sandi! Show and Tell drives me CRAZY and I mostly banned it a few years ago. Thank you. I'm doing it. I actually enjoyed show and tell - for the first time EVER! But I am still going to keep it for after Spring Break. Then none of us (kids, parents or me) will get bored or tired of it. Do you think this would be too difficult for pre-K? Maybe for the second half of the year?